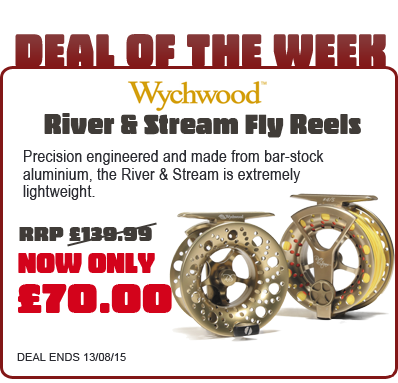 In the pursuit of stronger and lighter fishing tackle, Wychwood have really pushed the boundaries of 'Lightness' with the River and Stream Fly Reel. All this has been possible through Wychwood's Multi-Axis CNS Machine Technology which is a precision engineering process that takes a lightweight structure and makes it even lighter! By removing excess material but without compromising the structural properties of the fly reel, Wychwood have come up with a #2/3 weight reel that weighs an unbelievable 50g. The #4/5 also weighs an incredible 58g. However given it's inherent lightness, you would be wrong to underestimate it's strength and power. It's made from Bar-Stock Aluminium and features Wychwood's new, innovative Adjusta-Clicker Drag System which prevents over-run of your fly line. So you can be assured that this small reel won't let you down. Grab yours today at this fantastic price while stocks last.